I've been going through a bunch of my old Tupperware bins that I've had for-ever. I've been able to throw away a lot of things that I've been holding onto for no reason but I've also found lots of 'treasures' to laugh about. Like my very first cell phone that my parents gave me for Christmas when I was 16. Aubrey actually asked me if it was a walkie talkie! Lots of old Nintendo games. And oh yes, I was a member of the safety patrol. WALK, DON'T RUN!! 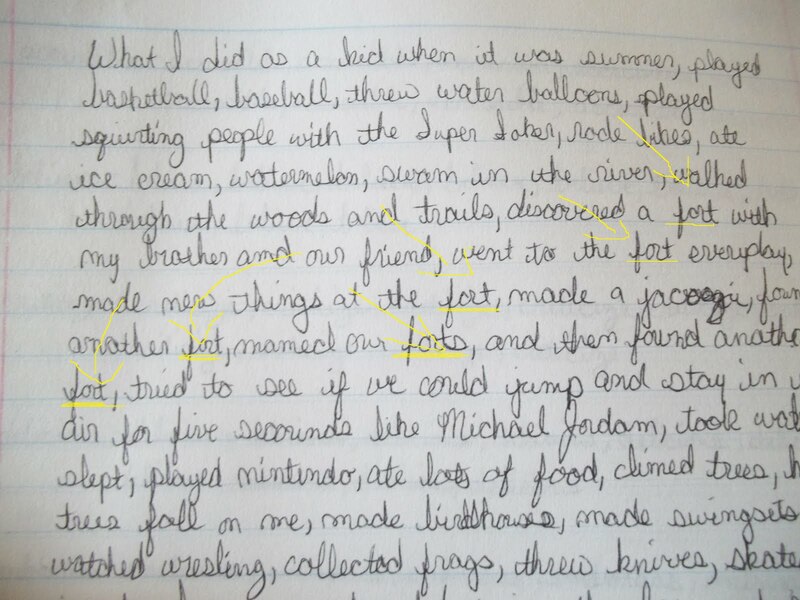 I've found so many little notes and things that I wrote when I was a kid to laugh at. HAHA! I hope my Brother reads this and gets a good laugh. And did you ever play MASH?? I would be married to Jonathan Taylor Thomas, we would have our honeymoon in Hawaii. He would have worn a gray tux and I would have had a blue wedding dress. We would have 4 kids, living in a brick house with a cat. I would also be a billionaire actress. I don't know about all the rest but the billionaire part would be great! I found lots of letters that I wrote to people and places but this one was my fav! I wanted to be a Power Ranger soooo dang bad!!!! But this next one has got to be my favorite. 1. The amount of times I use the word fort in the same sentence. Fort building was an integral part of my growing up as you can see. And as I'm looking at this I've realized that the whole essay is 1 sentence! HAHA, I don't think there is one period throughout that whole excerpt. The next thing that stands out is where it says climbed trees and then it cuts off a word. 'had trees fall on me'. TRUE STORY, my Brother thought it would be a great idea to throw a rope over a tree limb and make it into a see-saw with him on one end and me on the other. My brother was a big boy and with him trying to hoist me up the tree limb snapped and landed on my head and I'm pretty sure I was knocked unconscious for a few minutes. And last but not least did you notice this part!!?? Also a true story! That's right my brother had knives as a kid and he lived to tell about it! GASP!! We were country kids, we walked around barefoot, drank from a hose, played in the woods, everything your read we did and a whole lot more. 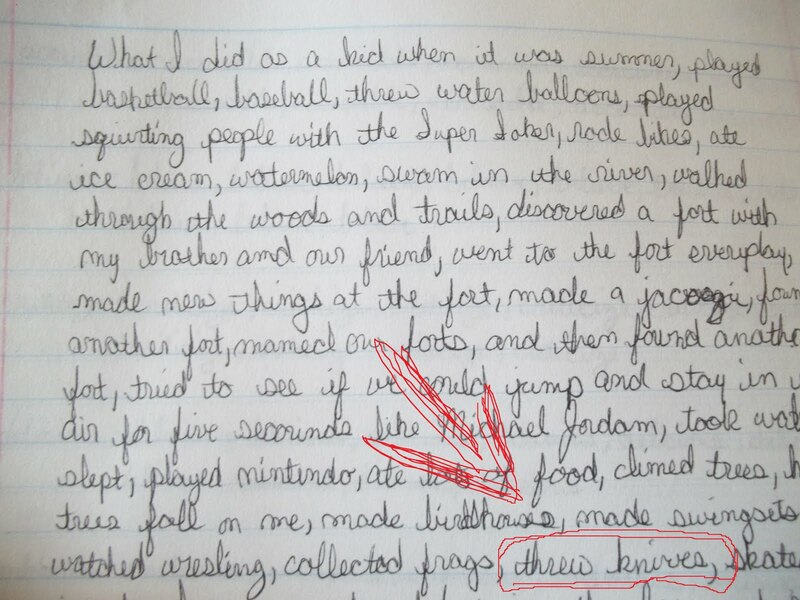 I was probably five or six when my brother was outside throwing some of his knives at trees. Now these were hunting knives and utility type knives but I wanted to play too so I ran inside and grabbed one of my Mom's steak knives out of the drawer and started trying to throw it at the tree. Only when I threw it, it didn't hit the tree and I looked all around me but I couldn't find it!! ITS STICKING OUT OF YOUR LEG!! And it was! Instead of sticking it in the tree I had thrown it right down into my own leg. It was very superficial and not deep at all even though I still have the scar! I pulled it out and went to hunt down my Mom. Did she rush me to the hospital? She washed it off in the sink and told me not to do it again and sent me back outside to play. Ohh the good ol' days. I have some really great memories of summer as a kid. I hope that when my kids are old enough to write an essay about summer it will be just like this one... except the knife in the leg, not that part.